Duxford became home to the 78th Fighter Group when they arrived in England with their P-47B Thunderbolts in 1943. The objective of the American fighter units was to gain air superiority over the Luftwaffe in support of their daylight bombing campaign. By 1944 they achieved their objective. Richard Taylor commemorates the valiant contribution of the 78th Fighter Group with a fine new rendition showing P-47D Thunderbolts departing Duxford en route for the north coast of France, and a low-level strafing mission. It is the spring of 1944, and with the Normandy invasion just days away, the Thunderbolts are already painted with invasion markings. A striking and emotive painting from a rare emerging talent. 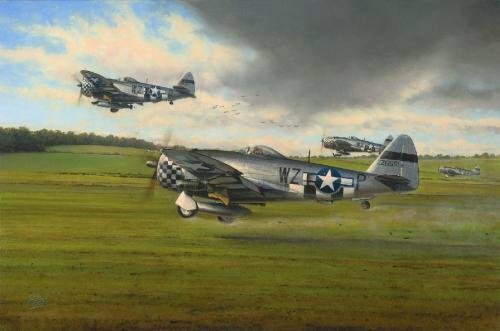 Joining artist Richard Taylor in signing this outstanding tribute to the P47 Thunderbolt, each print in the entire edition is signed by one of the most respected P47 fighter Aces who flew combat over Europe during World War II. Every print in this exclusive Fighter Aces edition has been signed by three additional top P47 fighter Aces, who all flew combat in Europe during WWII. There are a total of FOUR signatures in this edition. A very small exclusive edition of just 25 copies is issued inscribed with a beautifully hand-drawn original pencil drawing by Richard and just TEN COPIES ONLY will be issued with a Double pencil remarque which can be either two separate works of art or combined together to form a superb tableu below the image. Richards remarques are outstanding and he has quickly gained a loyal following amongst collectors with the remarqued editions of his previous releases almost selling out on issue.